Last year, I told you about Yumi, a delightful children's picture book about a Japanese kokeshi doll. Today, I want to share a new find with you. Aoki is another in the kokeshi series by Annelore Parot, published by Hardie Grant Egmont (2011). Meet Yumi, the youngest of the Kokeshi. She is adventurous and clever. She takes great pride in everything she does, and personifies the universe that artist Annelore Parot has created for her characters. She loves to dress up, go to school, go to parties and solve problems! Help Yumi to find the right Kimono to wear, and learn Japanese phrases. Find Yumi's friends, and then choose an outfit for a dress-up party! Decide the best sushi for Yumi to eat and then fall into a Kokeshi filled dream! 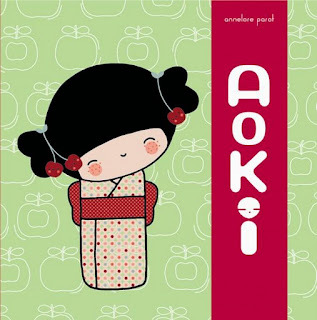 Aoki is just as elegant and sumptuous as Yumi. Parot has kept to the formula that little girls loved in Yumi - padded and appliqued cover, characters who genuinely look just like kokeshi dolls, lots of intriguing patterns in the art work, and little puzzles to solve behind flaps and through windows. Even the endpapers have that certain je ne sais quoi, a style that will have kids asking for more. The story isn't complicated. It's a journey with a happy conclusion though, and lots of opportunities along the way to learn a little about Japanese culture and language. Exposing children to other cultures through literature is such a good way to develop tolerance and empathy - throw in the fun of a puzzle book and a toy theme and it seems Egmont have another winner! @JB RowleyThe kids will get a real flavour of Japan from both Aoki, and Yumi. And I think reluctant readers will enjoy the minimal text and the activities to do in the books. Thanks for contributing, JB! Can't wait to read Yumi and Aoki. They sound lovely! Sounds like a lovely book. Couldn't agree more with your sentence "Exposing children to other cultures through literature is such a good way to develop tolerance and empathy"
@Ali BI know from what you've said at Literary Lunchbox that illustrations are important to you - I think the artwork in particular will grab you immediately. @Playing by the book I don't review as many of those books as you do at Playing by the Book, or as Paper Tigers do, but I love to find them and promote them, Zoe!